Many of us have experienced inquisitive preschoolers who want to be in the kitchen doing idle stuff. Oh, and their questions — “Mamma what’s this,” “How do we eat this,” “Why are you cooking that,” “Can I taste the salt,” “Can I get some sugar,” “Can I touch this or that?”— and they go on and on! If not the questions, then they end up with some dangerous activity when we are too busy working in there. So how do we keep a preschooler engaged in kitchen in a safe manner? Plus, it will be great for him/her to learn fun stuff here. Ideas for indoor games plus a few cooking activities can help you manage your preschooler better in the kitchen. We have expert views and activities to establish that. So, read on! “A preschooler in the kitchen wants his hands in every pie!” says Dr Anjali Mehta, paediatrician and mom of two. She adds that having him/her engaged in the kitchen is like him/her engaged in a classroom. Preschoolers can learn counting (number skills) when we engage them in the kitchen. The metric system — weighing, measuring, and so on — can be learnt playing indoor games in the kitchen too. Cleanliness and sanitation: washing veggies, keeping utensils, and the cooking platform clean, while keeping yourself mess-free, is also an art to be learnt in the kitchen. With so many learning possibilities and more, available right under your nose, I’m sure you want to know how to engage your preschooler in the kitchen. So, read on. “Ownership makes everything more fun,” says Rushali, a mother of two who is also a part-time artist. She recently engaged her preschooler in the kitchen by making him paint an apple on a plain apron. “Apple is my younger one’s favourite fruit. Painting it on the apron got my elder son excited too,” she adds about her 2 and 5 year-olds respectively. Like Rushali rightly mentioned, creating or painting something gives children a feeling of ownership, which makes them happier. This sense of ownership can be invoked by letting them paint and create things in the kitchen. Spread a messy mat on the kitchen floor and create the space for painting. Let your child choose the object on which he/she would like to paint. Rushali’s sons used the apron. You could use a cup or a table mat. While you work in the kitchen, let your child paint the object. Assist him/her when required. Your conversations can be about the various uses of the object he/she is painting. For instance, an apron is put on to avoid getting our clothes messy in the kitchen. These conversations and activities make your child more involved in the proceedings in the kitchen, instead of just being nosy, naughty, and fidgety in there. 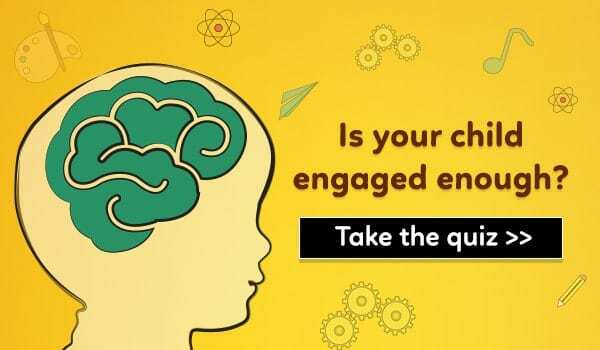 So the next time, before you want to shoo your child away from the kitchen, think of indoor games or activities that you can do. Well, this one is from my personal space. Even today, my five-year-old gets thrilled about the idea of kneading some dough for his chapatis. Get your child to wash his/her hands thoroughly. Explain that before touching anything in the kitchen, our hands have to be squeaky clean. In a plastic (or unbreakable) container, preferably one that has a wide mouth, add some plain dry flour. Add some water to it and let your child move his/her fingers in the semi-wet dough. You can assist him/her by holding hands or by explaining how the fingers should move. Help your child knead the flour into a ball of dough. He/she will surely ask for your assistance since it’s not an easy job. Once done, wash your child’s hands again and prepare chapatis out of the dough that he/she had kneaded. Of course, you will have to fix it a little! The chapati that comes out of this little kitchen play idea will be the yummiest ever! Don’t buy my word? Try it and see for yourself! 3. Kitchen play activity: Pick and drop those spoons! This one is in the lines of the game – fetch. Preschoolers in the kitchen are anything, but calm. They want to touch and explore every utensil, especially since we want them to stay away from most of them. Place several spoons on a tray and keep it on a kitchen shelf/table that your child can reach. Place a spoon stand (or any spare pen stand if you have) at the other end of the kitchen. The distance is important because we want the child to pick a spoon from the tray placed at one end and then carry it to the stand placed at the other end. Explain the process to your preschooler and tell him/her that it’s his/her responsibility to place the spoons neatly in the stand. Preschoolers enjoy the physical work that this kitchen activity involves and get busy with you in the kitchen. Best part, you can get your child to actually sort spoons, instead of a pretend play in the kitchen. So, what say? Supriya runs a bakery from home so it’s justified that she spends most of her waking hours in and around her kitchen. Her two sons run the bakery with her! Supriya gives each of her sons some fresh cream in an unbreakable bowl with a plastic whip to go with it. They whip and mess around with the cream, thoroughly enjoying the process, while she’s busy baking. The messy cream? Well, that’s half eaten by the time they finish. Two children engaged in the kitchen and how! “When I bake a cake for them, I let them prep the dish,” says Supriya as she continues talking about her kids’ involvement in the kitchen. Your preschooler too can help in the kitchen before you bake for him/her. Let your child grease the baking dish with butter by using hands or with a spatula. You can also get your child to place parchment/butter paper on the baking dish. Let your child then sprinkle flour on the dish and aha! Your baking tray is good to go! Can be strawberry or any other fruit too! Get your child to decorate a cupcake or any other cake that you’ve bought or baked by placing berries/fruits on it. You can use the cream whipped by him/her. Kids enjoy decorating and placing cherries on the cake. It makes them feel important, as according to them, the beauty of the cake is everything. It is actually everything, isn’t it? On toasted/untoasted slices of bread, spread some butter. Use a plastic butter knife so that your preschooler can use it too. On the buttered slice, place pre-cut veggies, cheese, and garnish as per your child’s taste and there, your easy peasy snack is ready. A simple engagement technique for your preschooler in the kitchen. Right? For all the little chefs out there, this activity is mixture of endless fun! You can do this activity before your child comes into the kitchen to ‘help’ you. Cut a sheet of newspaper so that it measures 10 inches by 7 inches. Roughly a rectangle. Cut another strip of newspaper to measure 10 inches in length and 2 inches width wise. Measure the strip across your child’s head. It should encircle his/her head and fit like a circular crown. Glue the ends so that the strip fits snugly around the head. Now fold the rectangular sheet of newspaper so that it becomes a hollow cylinder. We want the cylinder to be glued to the circular strip to make a long chef cap. Make your child wear the chef cap and let the sous-chef help you out in the kitchen. The experience will be lots of fun! Farida’s three-year-old opens the refrigerator just to look around. Ask him and he says it’s fun. Why don’t we actually get him busy with indoor games that actually involve opening the refrigerator? Allow your child to open the refrigerator and peep inside. Ask him/her to see all the items placed in there and remember them. Even cooked food counts. Once the door of the refrigerator is closed, he/she needs to name the items that he/she spotted in the fridge. Applaud for every correct answer and let the incorrect answers pass. Preschoolers really enjoy this kitchen memory game and as they play, you can get lots of work done in the kitchen (which otherwise is difficult in their presence). Cooking is all about measurements, yes? Rice takes this much water while dal needs another quantity. Baking means checking minute measurements, while frying demands lots of oil. All in all, the kitchen is a game field of measurements. So, let your preschooler learn measurements in there. Tea spoon, salad spoon, soup spoon, table spoon, etc. Explain the sizes and the logic behind having such different measures in spoons. If you have a kitchen weighing scale, show him/her how the veggies are weighed. Talk about kilogram and gram. Preschoolers are smarter than we usually give them credit for. So, try it! Ideally, we should all be segregating our waste into two separate bins. The wet waste bin and the dry waste bin. If you’re not doing it, you should start now – it really helps in making the world greener! Ensure that you use clean bins for this activity. Toy bins will also do. When your preschooler is in the kitchen with you and you are throwing waste in the bins, explain which waste material goes in which bin. The wet waste bin will have vegetable peels, egg shells, and so on, and these decomposable items help in making compost. The dry waste baskets will contain plastic bottles, used paper and the like. This kitchen activity simply teaches them about keeping the environment healthy and is also a good initiative at your end. Preschoolers enjoy making a mess more than anything in the world. What better way to utilise this energy than to get them to mash soft bananas and then make smoothies? Place 3 to 4 ripe bananas on a plate. Let your preschooler peel them. In a separate bowl, give him/her a plastic masher and let the mashing begin. Your mashed bananas are ready! Show them around the kitchen and identify the healthy food choices. Get pictures of those food items that they have seen. Next, introduce the junk food items and get pictures for them too. Tell them that as a rule, healthy food needs to be finished first, before they demand junk food snacks. Make a chart by placing pictures of healthy foods in one column and junk food in another. Decorate it in their room or in the kitchen itself. A good reminder to stay healthy for the entire family, isn’t it? 12. 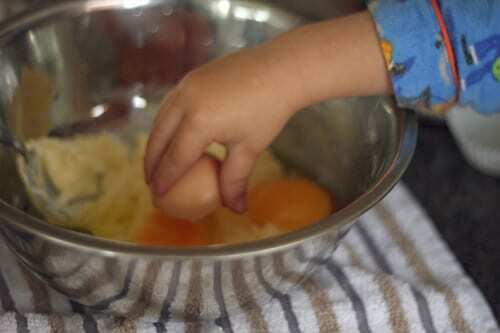 Preschooler in the kitchen: Breaking those eggs! This is mess at its biggest form, yet a lot of fun. Get your child to break eggs in a bowl. Teach him/her that no shells should go into the bowl. Trust me there’ll be lots of mess but he/she will be thrilled to no end! 13. Indoor games with food: What’s your favourite food colour? What’s your child’s favourite colour? Decide upon a colour (preferably your child’s favourite colour) and cook food that represents only that particular colour during any chosen day. For instance, to show white, make rice or white pasta. For red, make kidney beans and so on. Explain the idea to your child before you begin cooking. Your child will get excited. Get him/her to help you in the kitchen doing basic chores like fetch the napkin, the spoon, plate, and so on. When the food is ready, be prepared to relish the excitement of your child. My son’s green found its way into green peas samosa and spinach soup! Get your child to prepare a choco-dip to eat with his salad, dessert, or just like that. The dip can be made out of regular chocolate bars. Let your child break the bars into small pieces and then you melt it in the microwave. Once it’s a little cooled down, transfer it to your child’s plate, and let him/her relish the fun. This is one of those indoor games for the kitchen that can be played once in a while and gives you enough time to complete your chores! 15. Snack for preschoolers: Pack a snack! Get your child to experience how you pack his/her snack in a tiffin box. Although they still don’t attend formal schools, preschoolers carry food in lunch boxes when they step out with their parents. This is a good way to get them to experience packing their own food in a box. Teach your child the way to use foil paper to wrap the snack in. Explain that while packing a snack box, one must remember to pack paper napkins and spoons as well. They are a part of packing the snack box. Teach him/her how to fill the water bottle. And with that, your preschooler’s snack box is ready to go! This is more of a post cooking activity where you can get your child to help set the table. Teach him/her about mat and cutlery placement. Talk about keeping the table clean. Talk about using correct cutlery to eat. Let him/her try out a few pieces of cutlery if he/she wants. Ignore the mess that he/she creates–eventually, he/she will learn. Preschoolers in the kitchen: what’s the conclusion? Preschoolers are curious and having them unattended in the kitchen is a risky situation. Since we have to be in the kitchen for at least some part of the day, the various kitchen indoor games and engagement activities will come to our aid. When we get them busy in the kitchen doing activities that they like we keep them engaged and safe at the same time. Worth the effort, don’t you think? What are the ways in which you engage your preschooler in the kitchen? Share a few ideas for indoor games with us. Comment now! 1 – You can give your kid small curry leaves bunch and ask him to separate each leaf and you can keep it in box. Parents need to appreciate the child and say that helps a lot and saves their time. etc. So, they find happiness helping others. 2 – You can give a bowl and ask them to mix kitchen items used in cooking. like3-4 seeds of different dal s, pinch of salt, sugar, turmeric, cumin seeds etc and explain them what is what. They will enjoy mixing all those…And that mixture can be poured to a plant in balcony..